Manufacturer of a wide range of products which include servo motor, electric servo motor, dc servo motor and ac servo motor. We have a complete devout in developing highly demanded Servo Motor. 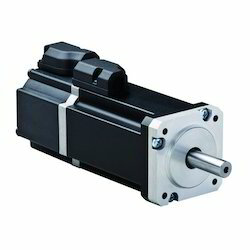 It is the integrated A series model of servo motor which is best suited for motion applications in diverse industries. The offered model is fitted with 2500 PPR encoder which can be multiplied to 10000PPR by controller logic. Further, the space saving motor is accessible from us at a leading price. The A series is an Omni bearing integrated servo system with advanced functions. The 2500PPR encoder is automatically multiplied to 10000PPR by X4 logic for increased control accuracy. We have firm allegiance in developing finest grade Electric Servo Motor. Specially designed for synchronized operations the offered model is best suited for flying shear and rotary cutoff applications. 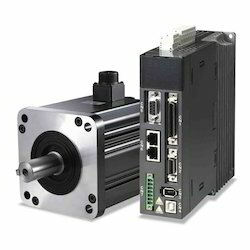 Featuring unique and most significant functions for enhanced performance the silent and maintenance free motor is comes with open interface for high speed communication. Built-in electronic cam (E-CAM) function which is the best solution for flying shear, rotary cutoff and synchronized motion applications. Whole new position control Pr mode is a unique and most significant function that provides a variety of control modes and definitely enhances system performance. Can open interface for high-speed communication. The full closed-loop control, auto notch filter, vibration suppression and gantry control functions help to perform complex motions that require high precision and smooth operation. The 20-bit superior resolution encoder which is essential for accurate positioning applications is equipped as standard. Built-in position feedback interface is able to read second feedback signals from motor encoder and send the current position back to the drive to form a full closed-loop so that high accuracy position control can be accomplished. We have gained huge acceptance as major firm offering top quality DC Servo Motor. The smooth operation and maintenance free lifespan of this model is highly acclaimed across the robotics and CNC machinery industry. The offered model is fitted with high quality components that ensure superior precision in linear and angular position. Further, the next generation model is accessible from us at the best price in the industry. High-resolution encoder with 17-bit 160,000 pulses/rev. With the aid of hi-tech advancements, we are instrumental in developing high quality AC Servo Motor. 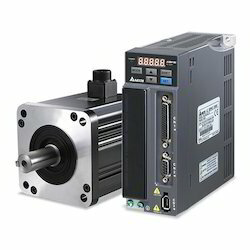 Designed to serve the challenging requirements of industrial automation fields the offered motor comes with standard functions of a digital servo system. It is a cost effective and maintenance free motor is used widely to actuate the movements with its innovative components. Further, the precise and high performing motor is accessible in varied models. The B series is a digital servo system with standard functions. The B series is a cost-effective and satisfactory servo system that fills the most basic and functional requirements of industrial automation field. It provides built-in Position / Speed / Torque control modes and supports pulse command input and analog signal control. Parameters editing and operation is done via an optional handheld digital keypad. The gain tuning function allows easy operation and the internal memory blocks shorten the parameters upload and download time.